Join a team that supports your growth.The career you want is just a click away. Brighter futures start here. Welcome to BrightView. We’re a team of talented professionals, driven by results and relationships, and committed to taking care of each other, clients, and communities. BrightView was recently formed through the combination of landscape industry pioneers and leaders, Brickman and ValleyCrest. This defining event united more than 140 years of experience, an extraordinary portfolio of high-profile projects and clients, and a vast, national network of expertise and innovation. As one and true to our name, we’re reinventing the industry while affording our 22,000+ team members access to the most comprehensive training, resources, benefits, mentorship, and opportunities for career advancement. A brighter future is in your hands. We’re currently seeking an Irrigation Technician. You are able to foresee potential problems and have the specialty skills needed to solve them. Careful planning and the ability to anticipate issues are qualities which BrightViewparticularly value. People with your mindset and proactive work-style, are just what our customers expect. In this position, you’ll monitor and test new installations, troubleshoot and repair problems, observe pipe and valve placements, and evaluate start-ups, winterization and overall operation of the irrigation system. You’ll also conduct and record detailed inspections and plan/execute upgrades of client systems. 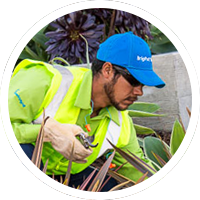 Along with supervisory skills and your proactive manner, we require 1-3 years of productive experience in the installation, inspection and repair of irrigation systems. A valid driver’s license and good knowledge of trenchers, multi-meters, wire locators, ditchers and pipe sizing are also essential. Bilingual in Spanish and ability to create and read site map colored charts/legends is a plus. BrightView Landscapes, LLC is an Equal Opportunity and E-Verify Employer.